How do we know that Dresden was a legitimate military target? Holocaust deniers often use the Allied bombing of Dresden (February 13-14, 1945) as evidence of Allied war crimes. They do so to minimize, by comparison, the systematic murder committed by the Nazis. Dresden was an undefended cultural city with no military or industrial importance. Dresden was a legitimate military target. It was an important industrial center with over 100 factories and enterprises that made armaments, torpedo parts, aircraft parts, U-boat and other naval parts, field radios, telephones, and precision optical instruments. It was also a key junction in Germany’s railway system, expediting the travel of supplies and soldiers to the Eastern Front. On February 13 and 14, 1945, British and American air forces bombed Dresden, Germany. The old part (Altstadt) of Dresden was completely destroyed and 25,000 to 35,000 people were killed. Dresden was an important industrial center with over 100 factories and industrial enterprises that employed 50,000 workers. These factories made armaments (shells and ammunition), torpedo parts, aircraft parts, field radios and telephones, steering elements for U-boats, specialized turbines for the Navy, X-ray equipment, and precision optical instruments. There was also a poison gas factory and a factory for anti-aircraft guns in Dresden. 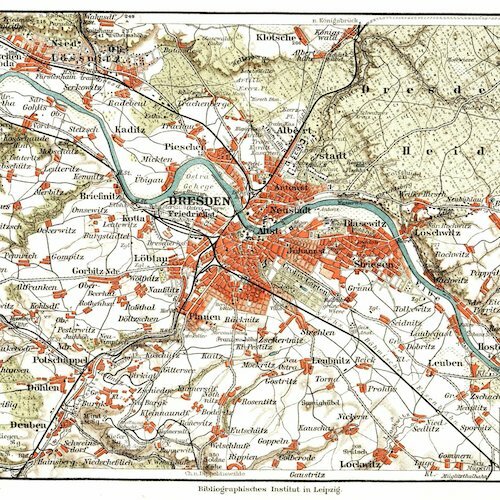 Dresden was also a key junction in Germany’s railway system, with rail lines radiating from the city in all directions. In 1944, the Nazis installed special tracks and platforms to expedite supplies to and from the city’s major armament factories. Many of these armaments traveled directly into combat zones on the Eastern Front. There were four freight yards and four main railway stations, all of which were used for military purposes and, thus, were legitimate military targets. By February 1945, Dresden was only 90 miles away from the Eastern Front. This fact further increased Dresden’s importance as a transit point for military traffic to and from the Eastern Front. For example, a total of 28 military trains, carrying almost 20,000 men and officers, passed through just one Dresden train station each day. Destroying these stations and rail lines, as a means of disrupting troop movement to the Eastern Front, was a military aim. Dresden was also an important river port and a center of freight traffic on the Elbe River, one of the major waterways of Europe. Until one month before the Dresden air raid, the Germans had placed anti-aircraft guns around the city. On February 13, 1945, the Germans ordered the removal of these anti-aircraft guns and the city was left largely undefended. These guns were placed closer to the Eastern Front as a means of slowing the Soviet advance. Neither the British nor the Americans knew that Dresden was undefended at the time of the air raid. Instead, they anticipated a stiffer response. From the 5th edition of Meyers Konversationslexikon (1893-97) [Public domain], via Wikimedia Commons. Dresden was a legitimate military target. It had militarily important rail lines and over 100 factories serving the Nazi war-machine. Dresden also played an increasingly critical role in German re-supply efforts as the Eastern Front drew closer to the city. The city was largely undefended because the Germans had transferred Dresden’s anti-aircraft guns to the Eastern Front. Allied forces did not know this. Holocaust deniers ignore both the military importance of Dresden and the context surrounding its defenses. David Irving, Firestorm over Dresden (video, Big Little Picture Company, 1991). Frederick Taylor, Dresden: Tuesday, February 13, 1945 (HarperCollins, 2004), pp. 148-153, 160-163; Marshall De Bruhl, Firestorm: Allied Airpower and the Destruction of Dresden (Random House, 2006), pp. 182-185. The British strategy of the area bombing of German cities created a controversy during the war that continues until this day. The strategy was meant to destroy the morale of German civilians by making them homeless with the hope that they would force the government to sue for peace. Area bombing did also destroy the factories, communication networks, and transportation facilities which were legitimate military targets but according to the Wirtschaft und Statistik, November 1949, Statistisches Bundesamt Deutschland [German Federal Statistical Office] it also killed 410,000 German civilians. Some consider the Allied area bombing of German cities to be a war crime, but in fairness it must be noted that the Germans applied the same strategy to all major British cities such as London, during the Blitz, and Coventry, seeking to destroy them down to the last brick and stone without concern for civilian casualties, which in Great Britian amounted to 61,000 dead and 86,000 wounded by the end of the war. (For the figures see http://myweb.tiscali.co.uk/homefront/arp/arp4a.html.) For thoughtful consideration of a difficult and complex topic from both the Allied and German side see: A.C. Grayling, Among the Dead Cities: The History and Moral Legacy of the WW2 Bombing of Civilians in Germany and Japan (Walker & Company, 2006); Max Hastings, Bomber Command (Pan Macmillan, 2020); and Herman Knell, To Destroy A City: Strategic Bombing and its Human Consequences in World War II (Da Capo Press, 2003).